This is “Introduction to Inequalities and Interval Notation”, section 2.7 from the book Beginning Algebra (v. 1.0). For details on it (including licensing), click here. Graph the solutions of a single inequality on a number line and express the solutions using interval notation. Graph the solutions of a compound inequality on a number line, and express the solutions using interval notation. An algebraic inequalityExpressions related with the symbols ≤ , <, ≥ , and >., such as x≥2, is read “x is greater than or equal to 2.” This inequality has infinitely many solutions for x. Some of the solutions are 2, 3, 3.5, 5, 20, and 20.001. Since it is impossible to list all of the solutions, a system is needed that allows a clear communication of this infinite set. Two common ways of expressing solutions to an inequality are by graphing them on a number lineSolutions to an algebraic inequality expressed by shading the solution on a number line. and using interval notationA textual system of expressing solutions to an algebraic inequality.. Determine the interval notation after graphing the solution set on a number line. The numbers in interval notation should be written in the same order as they appear on the number line, with smaller numbers in the set appearing first. In this example, there is an inclusive inequalityAn inequality that includes the boundary point indicated by the “or equal” part of the symbols ≤ and ≥ and a closed dot on the number line., which means that the lower-bound 2 is included in the solution. Denote this with a closed dot on the number line and a square bracket in interval notation. The symbol (∞) is read as infinityThe symbol (∞) indicates the interval is unbounded to the right. and indicates that the set is unbounded to the right on a number line. Interval notation requires a parenthesis to enclose infinity. The square bracket indicates the boundary is included in the solution. The parentheses indicate the boundary is not included. Infinity is an upper bound to the real numbers, but is not itself a real number: it cannot be included in the solution set. Strict inequalitiesExpress ordering relationships using the symbol < for “less than” and > for “greater than.” imply that solutions may get very close to the boundary point, in this case 2, but not actually include it. Denote this idea with an open dot on the number line and a round parenthesis in interval notation. Example 1: Graph and give the interval notation equivalent: x<3. Solution: Use an open dot at 3 and shade all real numbers strictly less than 3. Use negative infinityThe symbol (−∞) indicates the interval is unbounded to the left. (−∞) to indicate that the solution set is unbounded to the left on a number line. Example 2: Graph and give the interval notation equivalent: x≤5. Solution: Use a closed dot and shade all numbers less than and including 5. It is important to see that 5≥x is the same as x≤5. Both require values of x to be smaller than or equal to 5. To avoid confusion, it is good practice to rewrite all inequalities with the variable on the left. Also, when using text, use “inf” as a shortened form of infinity. For example, (−∞, 5] can be expressed textually as (−inf, 5]. Sometimes we encounter compound inequalities where the separate solution sets overlap. In the case where the compound inequality contains the word “or,” we combine all the elements of both sets to create one set containing all the elements of each. Example 3: Graph and give the interval notation equivalent: x≤−1 or x<3. Solution: Combine all solutions of both inequalities. The solutions to each inequality are sketched above the number line as a means to determine the union, which is graphed on the number line below. Any real number less than 3 in the shaded region on the number line will satisfy at least one of the two given inequalities. Example 4: Graph and give the interval notation equivalent: x<3 or x≥−1. Solution: Both solution sets are graphed above the union, which is graphed below. When you combine both solution sets and form the union, you can see that all real numbers satisfy the original compound inequality. The logical “and” requires that both conditions must be true. Both inequalities are satisfied by all the elements in the intersectionThe set formed by the shared values of the individual solution sets that is indicated by the logical use of the word “and,” denoted with the symbol ∩ ., denoted ∩, of the solution sets of each. Example 5: Graph and give the interval notation equivalent: x<3 and x≥−1. Solution: Determine the intersection, or overlap, of the two solution sets. The solutions to each inequality are sketched above the number line as a means to determine the intersection, which is graphed on the number line below. Here x=3 is not a solution because it solves only one of the inequalities. Alternatively, we may interpret −1≤x<3 as all possible values for x between or bounded by −1 and 3 on a number line. For example, one such solution is x=1. Notice that 1 is between −1 and 3 on a number line, or that −1 < 1 < 3. Similarly, we can see that other possible solutions are −1, −0.99, 0, 0.0056, 1.8, and 2.99. Since there are infinitely many real numbers between −1 and 3, we must express the solution graphically and/or with interval notation, in this case [−1, 3). Example 6: Graph and give the interval notation equivalent: −32<x<2. Solution: Shade all real numbers bounded by, or strictly between, −32=−112 and 2. Example 7: Graph and give the interval notation equivalent: −5<x≤15. Solution: Shade all real numbers between −5 and 15, and indicate that the upper bound, 15, is included in the solution set by using a closed dot. In the previous two examples, we did not decompose the inequalities; instead we chose to think of all real numbers between the two given bounds. The braces group the elements of the set and the ellipsis marks indicate that the integers continue forever. In this section, we wish to describe intervals of real numbers—for example, the real numbers greater than or equal to 2. Inequalities usually have infinitely many solutions, so rather than presenting an impossibly large list, we present such solutions sets either graphically on a number line or textually using interval notation. 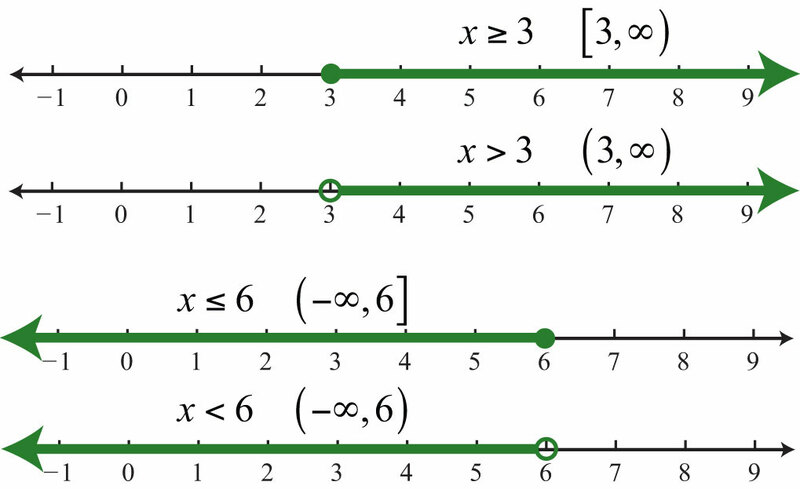 Inclusive inequalities with the “or equal to” component are indicated with a closed dot on the number line and with a square bracket using interval notation. 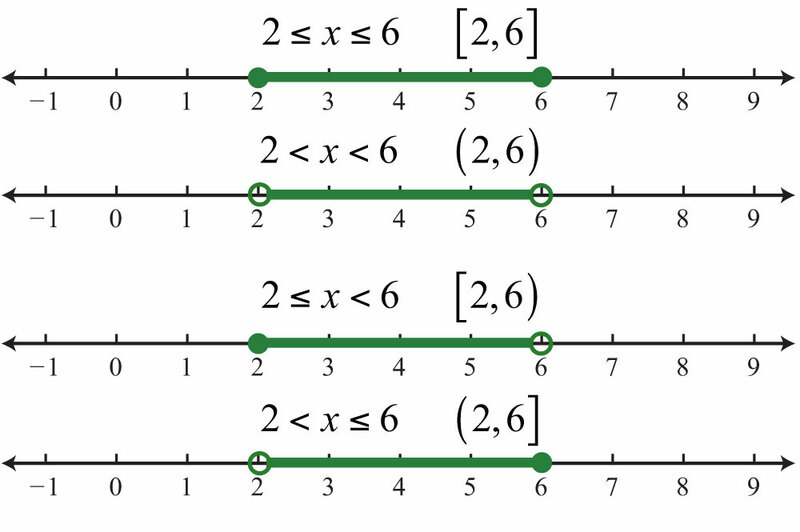 Strict inequalities without the “or equal to” component are indicated with an open dot on the number line and a parenthesis using interval notation. Compound inequalities that make use of the logical “or” are solved by solutions of either inequality. The solution set is the union of each individual solution set. Compound inequalities that make use of the logical “and” require that all inequalities are solved by a single solution. The solution set is the intersection of each individual solution set. Compound inequalities of the form n<A<m can be decomposed into two inequalities using the logical “and.” However, it is just as valid to consider the argument A to be bounded between the values n and m.
Graph all solutions on a number line and provide the corresponding interval notation. Graph all solutions on a number line and give the corresponding interval notation. Determine the inequality given the answers expressed in interval notation. 65. All real numbers less than 27. 66. All real numbers less than or equal to zero. 67. All real numbers greater than 5. 68. All real numbers greater than or equal to −8. 69. All real numbers strictly between −6 and 6. 70. All real numbers strictly between −80 and 0. 71. Compare interval notation with set-builder notation. Share an example of a set described using both systems. 72. Explain why we do not use a bracket in interval notation when infinity is an endpoint. 73. Research and discuss the different compound inequalities, particularly unions and intersections. 74. Research and discuss the history of infinity. 75. Research and discuss the contributions of Georg Cantor. 76. What is a Venn diagram? Explain and post an example.